It wouldn’t be unreasonable to ask why have I gone to great lengths to create this long post about the high school tall ship Concordia sinking. There are lots of reasons. Personal – I spent my high school years on a tall ship called Tabor Boy and launched The Tabor Boy Project, a website/living history project/social network, about that experience. So as a product of a long established, successful sail training program, I passionately believe in the power to transform young lives. Professional – I was the executive director of the American Sail Training Association from 2001 to 2008. During that period I had the opportunity to work with hundreds of different sail training vessels and tall ships from around the world. Professional/Personal – When speaking with the public or media at big tall ships events, I was invariably asked which was my favorite. As ASTA executive director, the only answer could be that “Like parents love their children, I love them all equally.” (politically correct) However, each sail training vessel and tall ship is unique in its own way and back on April 2, 2008, I wrote “I had the great fortune to spend my 4 years of high school sailing on a tall ship. If there was one educational sailing experience I could be jealous of, this (Class Afloat on Concordia) would be it.” By the way, I still feel that way today. Leadership – Over the years, I had the opportunity to work with Class Afloat’s founder Terry Davies and believe that it would be difficult to find another educational leader more professional and caring about young people and more knowledgeable about ships. Similarly, my experience working with various captains and crew members of the Concordia was always very positive. Leadership defines the success of a program and Terry Davies charted a proper course for Class Afloat. Reference – Today modern technology and media allow information to be distributed fast, far and wide. Unfortunately, accuracy isn’t always one of the characteristics but that might be a fair trade under many circumstances. Over time, inaccurate reports are generally weeded out and tossed aside. I’ve attempted to collect as many of the stories told to and by the media as possible. Going back later and trying to find this kind of information would be a gargantuan task. Doing it in real time is slightly easier. This is the web and many of these links will die but overall the post can serve as a pretty comprehensive reference for anyone interested in learning more about the casualty. Lessons to Be Learned – The Concordia sinking is a sad story with a happy ending. And while it’s very early days in the investigation, it presents a great opportunity to try to figure out what happened without the usual high emotion that surrounds an incident involving casualties or fatalities. In some respects, this is similar to the Miracle on the Hudson. As Sergeant Joe Friday used to say, “All we want are the facts” and there are more than 64 individual stories that can be told today but which over time will consolidate into one overall narrative from which we will hopefully learn some valuable lessons for the future. Up to this post, I’ve avoided editorializing, analyzing or making any judgement about what actually happened on the Concordia on February 17, 2010. I think that I’ll continue to leave the technical analysis to the professional investigators and others with more direct experience and knowledge about these things. I will continue to collect links about the sinking but anticipate (and hope) the pace of stories slows down so that I can get back to Sea-Fever’s regularly scheduled programming. I will also try to interpret/translate some of the technical findings so that non mariners can get a better understanding of the issues. I believe my Tabor Boy and ASTA experiences leave me well suited to the task. Finally, I will continue to champion sail training because I believe more than ever that there is no greater teaching platform than the tall ship and or campus than the sea. Sea(cret) Santa is pleased to report that there is no recession in the North Pole and he and the elves have been busier than a crew of one-armed sailmakers. Unfortunately, his Internet connection has been down for a few days so he’s been unable to post some of his favorite maritime gift suggestions. But here’s one that should make up for the silence. We’ve just tacked over at The Tabor Boy Project with a new masthead (above) and color scheme. While you’re there, check out all of the great new content too! The Coolest “OverSeas” College Study Program on the Planet! If you are a college student, or know one, who wants to make the most out of your college experience, you (they) have to check out SEA, which stands for Sea Education Association. At SEA, not only will you study “overseas” you’ll study in them too! Located in Woods Hole, MA, USA, SEA offers semester long college accredited programs on 2 tall ships in the Atlantic and Pacific Oceans that challenge you intellectually and physically by combining a sailing adventure of a lifetime with the study of the deep ocean. I could go on and on about the benefits of this experience but SEA president John Bullard already made a most persuasive case here. If for some crazy reason John hasn’t convinced you, maybe these short videos shot by program graduates will. Take your academic career to new heights, literally! Better than looking at a blackboard all day in the middle of January! Imagine challenging yourself to do something outside your comfort zone and making some amazing friendships in the process. How about learning from touching something alive that you actually caught? And who said school can’t be fun? I guarantee that in the future you will think of the SEA experience more fondly than that Political Science lecture every Tuesday and Thursday afternoon. Now, if you need a reason for why this might be important to you and the rest of the planet, you have to watch this video of Dr. Bob Ballard’s presentation at the February 2008 TED Conference. 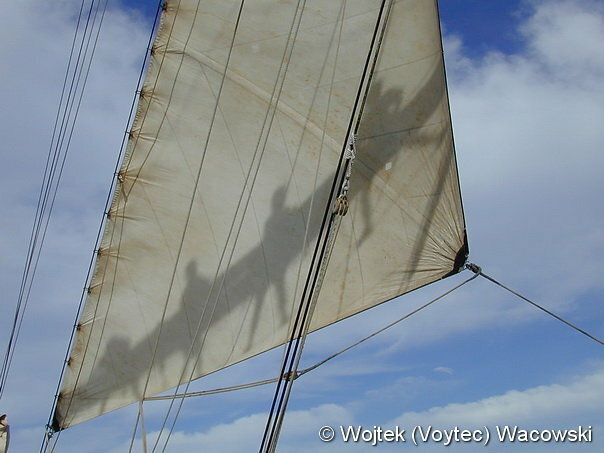 There is a whole new world for you to explore and there’s no better opportunity to do so than aboard an SEA tall ship. Launch your SEA adventure here! Posted on November 12, 2008 June 26, 2009 Author Peter A. MelloCategories Education, Environment, Experience, Experiential education, Leadership, life, maritime, Oceans, sail training, sailing, tall shipsTags college, SEA, Sea Education Association, study abroad, tall ships4 Comments on The Coolest “OverSeas” College Study Program on the Planet!